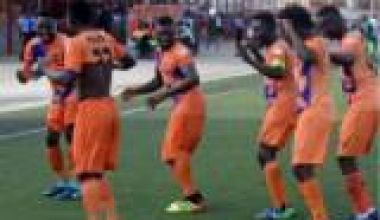 Akwa United continued their impressive run in Nigeria Professional Football League on Sunday as they stunned Heartland FC in Okigwe; beating their host 2-1 in matchday 11 tie. Mfon Udoh’s eighth goal of the season helped Akwa United to the crucial away win. Udoh’s goal which came in 72nd minute sealed all the three points for Akwa United despite Chidiebere Ajoku’s 57th-minute equalizer that had earlier cancelled Ndifreke Effiong’s fourth-minute strike. Heartland finished the last 16 minutes with 10 men when their goalkeeper Ebele Obi was shown a straight red card for deliberately handling the ball outside his area. This latest win has shot Akwa United to the second spot on the log in Pool B, two points adrift of FC Ifeanyiubah, who pipped Kano Pillars by a lone goal on Sunday in Nnewi. It was Uche Ihuarulam’s goal in the 66th minute that gave FC IfeanyiUbah the slim win. Elsewhere, Philip Auta netted the two goals as Yobe Desert Stars recorded a 2-0 home win over visiting Go Round FC in Damaturu. In Maiduguri, El-Kanemi and Gombe United played out a goalless draw, while goals from Abba Umar and Ismaila Issa Gata helped the struggling Wikki Tourists to a 2-0 win at home to visiting Rivers United of Port Harcourt. 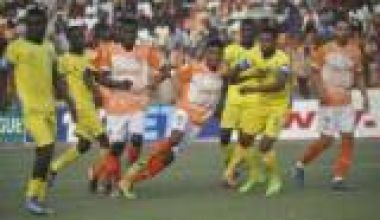 The game between Remo Stars and Rangers, as well as Niger Tornadoes against Lobi Stars, was postponed, due to continental involvements while Enyimba and Sunshine Stars shared the spoils in Akure after a 0-0 draw.